Yesterday Hot Wheels, Today Big Wheels – Annoyingly Boring? As the building project at the kids’ schools wraps up there is still plenty to do and still a need for large construction equipment. 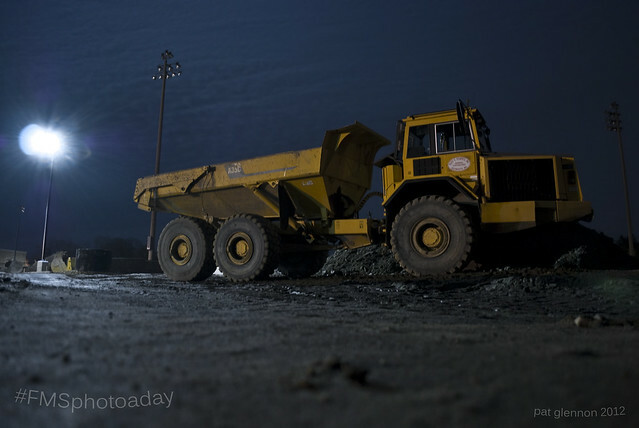 I had originally thought I would use one of them for yesterday’s “Vehicle” prompt, but then thought the juxtaposition between a little Hot Wheels car and a massive dump truck would be cool. Hey Pat,..Our group has a gallery, Gallery4, and we are having an open photography show in Jan. and Feb. The prospectus can be found on our web site. http://www.4thfloorartists.org and click on Gallery 4. Thought you might be interested.